In this article, we’re on a mission to help you find the best rechargeable flashlight for 2018. 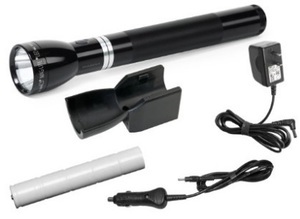 You don’t need to be an expert to know the benefits of owning a rechargeable flashlight. Obviously, the main advantage is the convenience of being able recharge your light instead of having to replace disposable batteries when they run out of power. 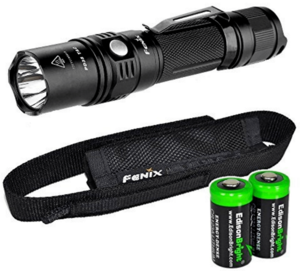 If you’re in a hurry, then check out the Fenix PD35 1,000 lumen rechargeable flashlight – it’s my personal favorite because it uses a rechargeable 18650 battery, or two 3V CR123A Lithium batteries. Not to mention it’s ridiculously bright! It’s the worst when you reach for your flashlight at the most crucial times, only to realize your battery is dead. Why? Because just like the rest of us, you forgot to recharge your battery. So, save yourself the trouble and remember always to CHARGE your RECHARGEABLE battery. Fortunately, many of the new rechargeable lights on the market contain some of the best technology in the business, lasting hours on each charge, outperforming its counterparts that run on disposable batteries. Along with convenience and performance benefits, another bonus of rechargeable batteries is they are better for the environment. Instead of throwing old batteries away all the time, you can recharge your flashlight over and over again without creating a single ounce of waste. It is always a great feeling to do something – no matter how small – to help the environment. 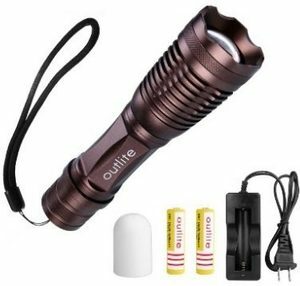 Of course, when you’re searching for a handy light, whether it does or does not feature a rechargeable battery, should not be your only criteria. That should only be one of many important elements for the shopper to consider, so take the time to review everything that a particular item brings to the table before you buy. Consider the amount of light it produces, its running time on a single charge or battery, the materials it is made from, and whatever else your criteria is, should all play a role in determining the best one for you. After reviewing all of the top rechargeable lights on the market today, we’ve selected our top 7 picks in the comparison table below. We’re confident you’ll find the perfect model for your needs. Looking For Different Types of Flashlights? In this article, we have assembled a list of four of the best rechargeable flashlights on the market today. If you are searching for a quality product that conveniently recharges before your next adventure, there is a good chance you will find plenty of suitable options below. If you’re in the market for different types of survival flashlights then click here to see my top picks in that category. This product uses a 18650 battery, which is common among rechargeable lights. This product includes a battery, along with two chargers – a wall charger, and a car charger. Most manufacturers do not include the extra car charger, so this product is the wonderful exception. With both a wall charger and car charger, you should be able to charge your light no matter where you are. Unsurprisingly, the multiple chargers are one of the top compliments for this product among customer reviews, along with the various operating modes and the brightness of the beam. Some buyers were very satisfied with the quality of materials since they expected a cheaply made product due to its price point. 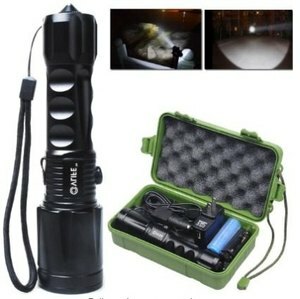 This model from CVLIFE is an all-around rechargeable light with a zoom function and plenty of light. 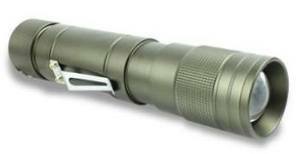 One of the top names in the business, MagLite has long been respected for their quality products. These are known to be tough and reliable to perform at a high level, time after time. The RL1019 is a rechargeable model that offers a range of modes between full power at 643 lumens and low power at 148 lumens. As a nice bonus, this item also provides ‘Eco Mode,’ where it runs at an efficiently low light output level for an extended period. This item has everything you would expect to find in a MagLite, and then some. It is water-resistant, drop-resistant, and will last for up to 4.5 hours on a single charge of its NiMH battery. Owners enjoy the adjustable beam width this item offers, along with an overall solid feel, which one can expect from the MagLite line. The X-4500 is rechargeable with three working modes. It puts out an intense light beam considering its compact design. The three available modes are bright, half-bright, and strobe. Those who have previously purchased the item love its sturdy build, and they also appreciate the ability to charge it via USB cable. Since it also conveniently serves as a power bank, users love being able to charge items such as cell phones, giving this product other uses. Yes, there are plenty of reasons to consider the X-4500, from its impressive 350-lumen output to its versatility. It is water-resistant, includes a clip and keychain, and the manufacturer provides a lifetime guarantee. Those in the market for an all-around rechargeable light that can do a little bit of everything would be wise to take a closer look at the Xtreme Bright X-4500. In recent years, one thing that has made LEDs so popular is the stunning amount of light they produce with such small bulbs. At first, it doesn’t seem possible that a light as compact as the Outlite E6 would be able to produce anywhere near 900 lumens, but that is what happens when LEDs are correctly put to use. Powered by either one 3.7V 18650 battery (which is included), or three AAA batteries, this product has enough power for almost any application. This item is 6.8’’ long, and buyers love both the power of the light and the flexibility of adjusting the beam to various widths. Quality construction is another point that is frequently brought up in the reviews, as is the free mini-keychain LED flashlight that is included with purchase. Today’s rechargeable flashlights can do everything that a flashlight with a disposable battery can do, so these units are certainly worth a closer inspection if you are in the market for a reliable, flexible unit. Having the ability to recharge your light rather than heading to the store to spend money on batteries is a big advantage, as is the comfort you gain from knowing that you have fully charged your battery before you head out into the dark. Hopefully, after a little more homework and research, you will determine that one of the five products listed above is perfect for your needs.